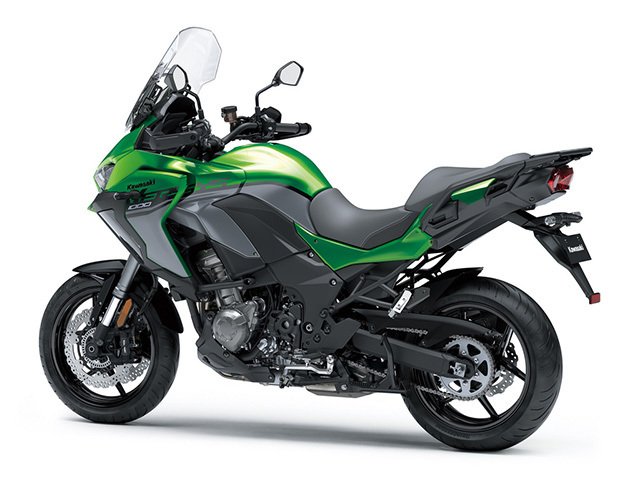 Kawasaki's cruise control system allows a desired speed to be maintained with the simple press of a button. Once activated, the rider does not have to constantly apply the throttle. This reduces stress on the right hand when traveling long distances, enabling relaxed cruising and contributing to a high level of riding comfort. Operation of the Electronic Cruise Control is conveniently from the left handle. The system can be engaged with the touch of a button. Kawasaki IMU enables inertia along 6 DOF (degrees of freedom) to be monitored. Acceleration along longitudinal, transverse and vertical axes, plus roll rate and pitch rate are measured. The yaw rate is calculated by the ECU using Kawasaki original software. Additional feedback from the IMU gives an even clearer real-time picture of chassis orientation. In addition to more precise management, feedback from the IMU enables KIBS to incorporate an additional function. Corner braking management assists riders in tracing their intended line through the corner. Bosch's latest IMU is highly compact and very lightweight, weighing only 40 g.
The strength of Kawasaki's cutting-edge electronics has always been the highly sophisticated programming that, using minimal hardware, gives the ECU an accurate real-time picture of what the chassis is doing. 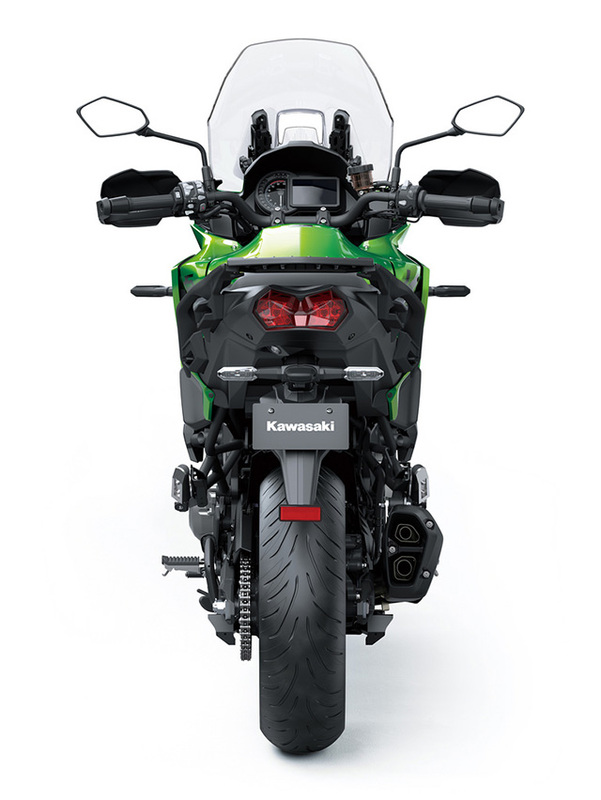 Kawasaki's proprietary dynamic modelling program makes skilful use of the magic formula tyre model as it examines changes in multiple parameters, enabling it to take into account changing road and tyre conditions. Using the latest evolution of Kawasaki's advanced modelling software and feedback from a compact Bosch IMU (Inertial Measurement Unit), KCMF monitors engine and chassis parameters throughout the corner - from entry, through the apex, to corner exit - modulating brake force and engine power to facilitate smooth transition from acceleration to braking and back again, and to assist riders in tracing their intended line through the corner. Kawasaki's supersport-grade high-precision brake management system is now standard equipment on the Versys 1000 SE. This is the same base system used on the Ninja H2 and Ninja ZX-10R, with programming and settings revised to suit the street performance parameters and long-travel suspension of the Versys 1000. 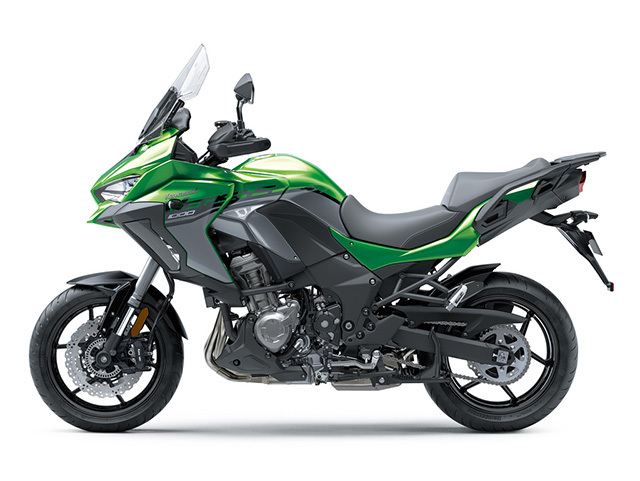 Complementing the Versys 1000 SE's exhilarating engine character, a contactless-type quick shifter enables clutchless upshifts and downshifts for seamless acceleration and quick and easy deceleration. During acceleration, the system detects that the shift lever has been actuated, and sends a signal to the ECU to cut ignition so that the next gear can be engaged without having to use the clutch. During deceleration, the KQS system automatically controls engine speed, allowing you to downshift without operating the clutch. KQS does not function below 2,500 rpm. New instrumentation with an advanced, high-tech design gives the Versys 1000 cockpit a very high-class appearance. The analogue-style tachometer is complemented by a full digital high-grade full colour TFT LCD screen. The VERSYS 1000 SE model's screen enables information to be displayed graphically. Two selectable display modes allow riders to prioritise the information they want to see depending on the kind of riding they are doing at the time. The aptly named Comfort Seat features thicker urethane cushioning to provide the comfort to enable long hours in the saddle, while offering taller riders a relaxed knee bend; and the Optional Accessory Low Seat (20 mm lower) prioritises an easy reach to the ground. Hand covers offer increased wind protection, which translates to added comfort when riding in cold weather. They also offer general protection for the rider's hands. Optional Accessory Grip heaters provide increased comfort on cold days. They fully enclose the grips, ensuring excellent warmth. Lightweight 6-spoke wheels that measure 17" are ideal for sporty street performance. Tyres selected for their road sports potential offer superb cornering performance for more fun in the hills, great high-speed stability, and a strong on-road image to go with the Versys 1000 SE's sporty character. Compared to the tyres used on the 2015-2018 model, overall grip performance (including in wet conditions) and feel from the road are both improved. 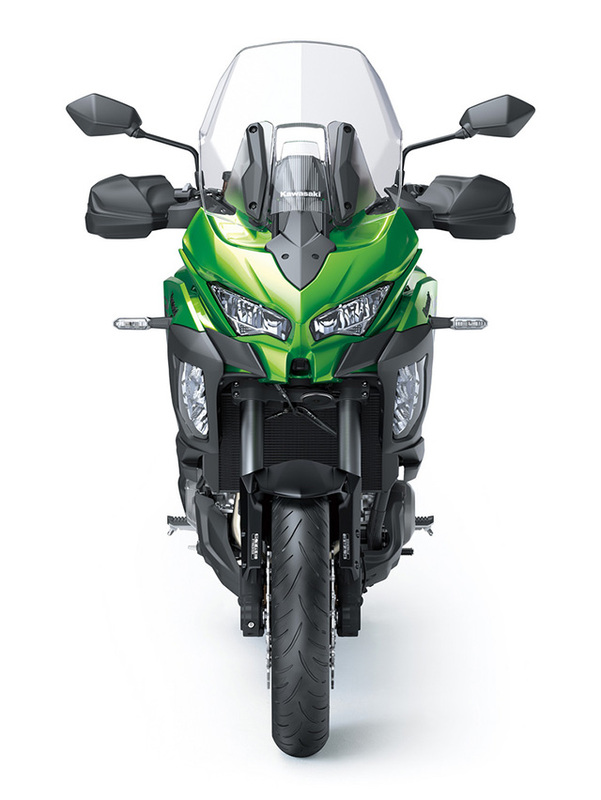 The VERSYS 1000 SE features a large windscreen, the range of adjustability is 40 mm. Height can now be adjusted from the rider's seat (without tools, using two knobs on the inside of the screen) to suit rider preference. 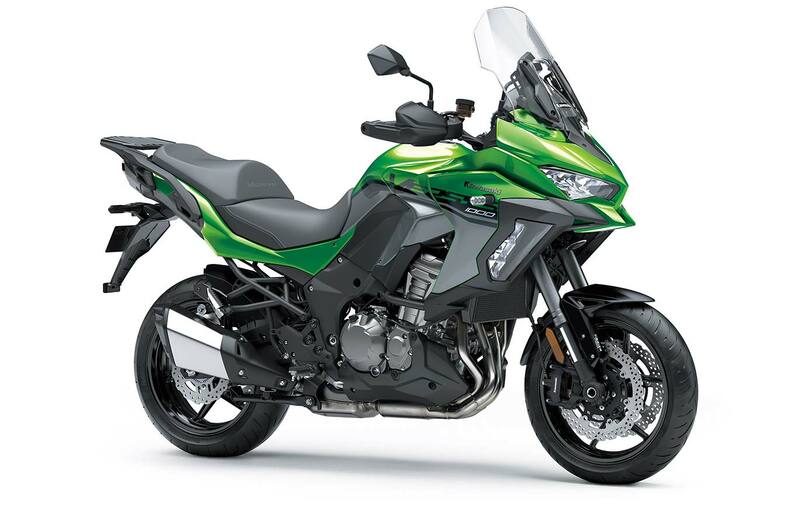 The VERSYS 1000 SE model's large windscreen is equipped with a centrally located vent. Opening the vent reduces the negative pressure effect in the cockpit, which means less chance of the rider being pulled forward at high speed. Revised upper cowling design and wider fairings provide increased wind protection, contributing to greater ride comfort. 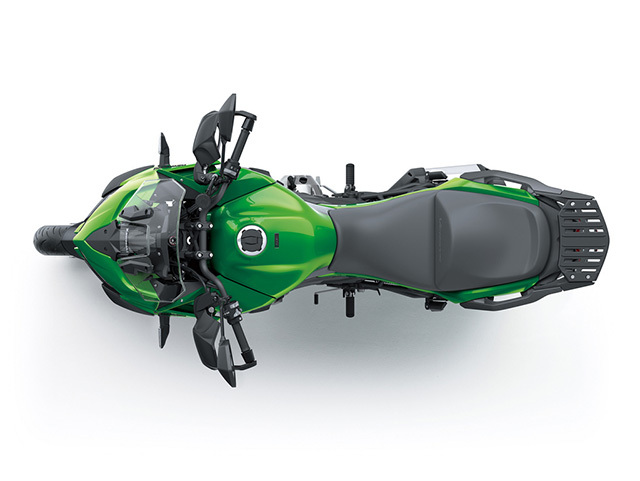 Kawasaki's new Highly Durable Paint and Highly Durable Matte Paint (used on the fuel tank, L/R side cowls, and L/R side covers) feature a special coat that allows scratches to repair themselves, enabling the paint to maintain its high-quality finish†. Soft and hard segments in the coat work together like a chemical spring, creating a trampoline effect that absorbs impacts.The Highly Durable Matte Paint is highly wear-resistant, enabling the paint's beautiful matte finish to be maintained for a long time. † Note: 1 In some cases, it takes more than one week for recovery. 2: The paint will not recover in the case of scratches caused by a coin or key, or zip fasteners. A Bluetooth chip built into the instrument panel enables riders to connect to their motorcycle wirelessly. Using the smartphone application "RIDEOLOGY THE APP," a number of instrument functions can be accessed, contributing to an enhanced motorcycling experience. A number of functions are available: Vehicle Info, Riding Log,Telephone notices, Vehicle Settings. Vehicle information downloaded to the app can be viewed via the smartphone. 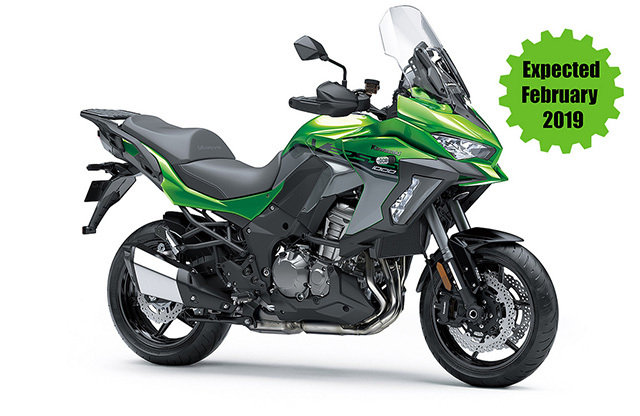 Available information includes: odometer, total time, trip A, trip B, fuel gauge, remaining range, average gas mileage, average speed, max lean angle (right/left), battery voltage, Kawasaki service reminder (set by the dealer), oil change reminder (set by the rider), plus an additional rider-selectable reminder. Wide handlebar offers easy control, especially for low-speed maneuvering. Positioned to offer a natural grip, it allows the rider's elbows to be slightly bent when sitting in a relaxed, upright stance. 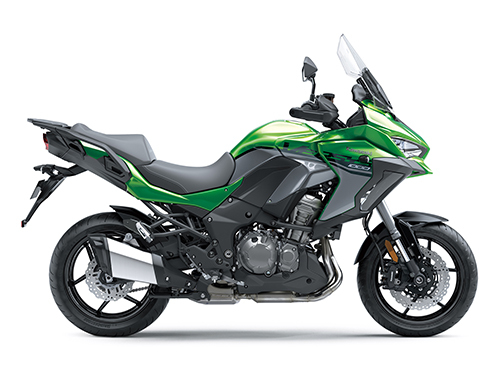 21-litre fuel tank contributes to the Versys 1000's touring potential. With engine and transmission settings, range (calculated) on one tank could be 400 km. (Range would vary depending on riding speed and conditions.) 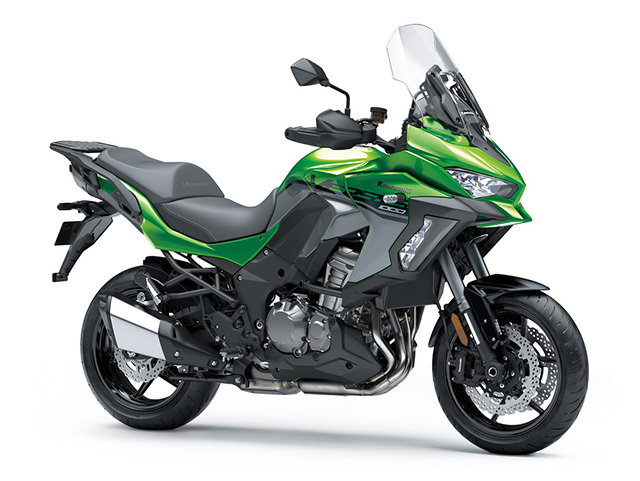 Advanced ECU programming contributes to the Versys 1000 SE's high fuel efficiency. Careful adjustment of fuel volume and ignition timing when speed is constant improves fuel consumption without compromising driveability.